LONDON - Blue State Digital, the agency that worked on Barack Obama's presidential campaign, has created an election website for Tony Blair as part of his effort to help Labour win a fourth term in office. The former prime minister made his return to UK politics yesterday, with a speech in his old Sedgefield constituency, at the Trimdon Labour Club. The website for the Office of Tony Blair will use the election 2010 website to post Blair's support for the Labour Party, and will feature videos of his appearances as well as news and comment. 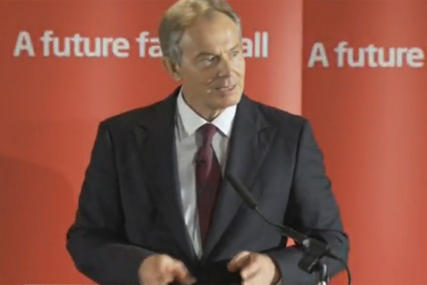 Blair used the occasion in Sedgefield to lend his backing to Gordon Brown and attacked the Conservatives and their 'Time for change' campaign slogan. Blair said: "I always used to say when some in our ranks urged a mantra of 'time for a change' in 1997, it is the most vacuous slogan in politics. 'Time for a change' begs the question: change to what exactly? And the reason an election that seemed certain to some in its outcome, is now in sharp contention, lies precisely in that question." The site is one of a number of projects that Blue State Digital has worked on for Blair since he left office. Last year, the agency revamped Blair's Faith Foundation website, and has also worked on his Sports Foundation site, Africa Governance Initiative and Quartet role in the Middle East. Other clients Blue State Digital has been working for in the UK include the Communication Workers Union in the fight against the privatisation of Royal Mail.